William Lyle Richardson (May 7, 1922 – February 25, 2006), known professionally as Darren McGavin, was an American actor. He was known for his portrayals of worldly, often somewhat gruff characters. Born in Spokane, Washington, McGavin claimed to have been a child runaway who spent his later childhood squatting in Tacoma. He began his film career while working as a set painter for Columbia Pictures, appearing in uncredited roles, and also starred in a regional Chicago production of Death of a Salesman in 1950. He subsequently originated roles in Broadway productions of My 3 Angels and The Rainmaker (both 1954), and went on to star in a further four Broadway productions before the end of the decade. Simultaneous to his stage career, McGavin also forged a career in film, starring in David Lean's Summertime and The Man with the Golden Arm (both 1955). 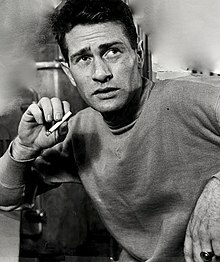 From 1958 to 1959, he played the title character in the 1950s television series Mickey Spillane's Mike Hammer, and subsequently starred in the NBC Western series Riverboat, first with Burt Reynolds and then with Noah Beery Jr. McGavin would go on to have a prolific career in television, appearing in numerous guest-starring roles throughout the 1960s and 1970s, before being cast in the title role of the television horror series Kolchak: The Night Stalker (1974–1975). Additional film credits include Airport '77 (1977) and Hot Lead and Cold Feet (1978). In 1983, McGavin starred in Bob Clark's seasonal comedy A Christmas Story, portraying Mr. Parker, the father of Ralphie Parker. From 1989 to 1992, he had a recurring role opposite Candace Bergen on the sitcom Murphy Brown, playing the title character's father, for which he was nominated for a Primetime Emmy Award for Outstanding Guest Actor in a Comedy Series. He had supporting roles in the horror film Happy Hell Night (1992) and the comedy Billy Madison (1995), playing the father of the title character, opposite Adam Sandler. McGavin died in Los Angeles on February 25, 2006 of cardiovascular disease, aged 83. William Lyle Richardson was born in Spokane, Washington, the only child of Reed D. Richardson and his wife Grace (née Bogart) Watson. His parents divorced when he was 11 years old, and custody was given to his father, who was employed as a traveling salesman for a chemical company. As an adolescent, his father boarded him with a family at their farm on the Puget Sound near Tacoma while he traveled for work. McGavin eventually ran away from the farm, and lived with a Native American family along the Nisqually River. His father was soon notified he had fled, and McGavin temporarily dodged police and welfare workers before his father enrolled him in a Catholic boarding school. Around age 16, McGavin left the boarding school and temporarily lived as a runaway under the wharf in San Francisco, before moving in with his mother and stepfather at their ranch in southern California. While attending high school in California, McGavin developed aspirations to be an architect, and after graduating enrolled at the University of the Pacific in Stockton, California to study architecture. He later studied theatre at HB Studio in New York City. While attending the University of the Pacific, McGavin took a side job building scenery for a local theater group. He subsequently dropped out college, and found work as a painter at Columbia Pictures movie studios in 1945. When an opening became available for a bit part in A Song to Remember, McGavin applied and won his first movie role. Shortly afterwards, he moved to New York City and studied at the Neighborhood Playhouse and the Actors Studio under teacher Sanford Meisner. In 1949, he joined the cast of a touring production of Death of a Salesman, playing Happy Lohman. He began appearing on Broadway in 1954, in productions of My 3 Angels and The Rainmaker (where he created the title role) opposite Geraldine Page. While in New York, McGavin also appeared on several live theater programs that aired on television, such as Kraft Television Theatre and The U.S. Steel Hour. McGavin returned to Hollywood in the early 1950s and appeared in the short film A Word to the Wives with Marsha Hunt, and had his first starring roles in the feature films Summertime, opposite Katharine Hepburn, and The Man with the Golden Arm (both 1955). Also in 1955, McGavin appeared twice in the anthology series Alfred Hitchcock Presents, first in an episode titled "Triggers in Leash" and later in an episode titled "The Cheney Vase," as a scheming caretaker and aspiring art thief, opposite Carolyn Jones, Patricia Collinge, and Ruta Lee. He also later appeared in an episode of The Alfred Hitchcock Hour titled "A Matter of Murder" in 1964. Throughout his career, McGavin starred in seven different TV series and guest-starred in many more; these television roles increased in the late 1950s and early 1960s with leading parts in series such as Mickey Spillane's Mike Hammer, in which he portrayed the title character from 1957 until 1959. He was subsequently cast as Captain Grey Holden opposite Burt Reynolds in the Western series Riverboat, which aired from 1959 until 1961; Reynolds was replaced by Noah Beery Jr. midway through the series due to disputes between Reynolds and McGavin. After his departure, Reynolds told TV Guide: "Darren McGavin is going to be a very disappointed man on the first Easter after his death." Though considered by critics to be among the best actors working in television at the time, in 1960, McGavin told the Vancouver Sun that he disliked most television, likening it to purgatory for a working actor. When Martin and Lewis broke up, McGavin played the role originally earmarked for Dean Martin in The Delicate Delinquent, Jerry Lewis's first solo film. McGavin was also known for his role as Sam Parkhill in the miniseries adaptation of The Martian Chronicles. He appeared as a fill-in regular in The Name of the Game in an episode entitled "Goodbye Harry" and was featured as a reporter in one of the Gene Barry segments. McGavin returned to theater in 1964, starring in a regional production of A Thousand Clowns, in which his teenage son, York, also appeared. In 1968, he starred as David Ross on the short-lived detective series The Outsider. McGavin was cast as the lead in the supernatural-themed television film The Night Stalker (1972). With McGavin playing a reporter who discovers the activities of a modern-day vampire on the loose in Las Vegas, the film became the highest-rated made-for-TV movie in history at that time; when the sequel The Night Strangler (1973) was also a strong success, a subsequent television series Kolchak: The Night Stalker (1974) was made. In the series, McGavin played Carl Kolchak, an investigative reporter for the INS, a Chicago-based news service, who regularly stumbles upon the supernatural or occult basis for a seemingly mundane crime; although his involvement routinely assisted in the dispelment of the otherworldly adversary, his evidence in the case was always destroyed or seized, usually by a public official or major social figure who sought to cover up the incident. He would write his ensuing stories in a sensational, tabloid style which advised readers that the true story was being withheld from them. McGavin reportedly entered into a verbal agreement with Sid Sheinberg (President of MCA and Universal TV) to produce The Night Stalker as a TV series as a co-production between Universal and McGavin's Taurean Productions. Early promises were never fulfilled, and McGavin expressed concern over script quality and lack of network commitment toward promoting the show. His concerns appeared justified, as the series drifted into camp humor and the production values declined in later episodes. In 1973, prior to the production of Kolchak: The Night Stalker, McGavin made his directorial debut with the film Happy Mother's Day, Love George, a mystery film starring Cloris Leachman, Ron Howard, and Bobby Darin. McGavin starred in the comedy Zero to Sixty (1978), produced by his wife, Kathie Browne, in which he portrayed a divorced man attempting to sort out his life. In 1983, he starred as "Old Man Parker", the narrator's father, in Bob Clark's comedy A Christmas Story. He portrayed a middle class father in 1940s Hammond, Indiana, who was endearing in spite of his being comically oblivious to his own use of profanity and completely unable to recognize his unfortunate taste for kitsch. Blissfully unaware of his family's embarrassment by his behavior, he took pride in his self-assessed ability to fix anything in record time, and carried on a tireless campaign against his neighbor's rampaging bloodhounds. The film was a moderate box-office success and went on to become a classic holiday film in the years since its release. McGavin appeared in 1984's The Natural as a shady gambler, and appeared on a Christmas episode ("Midnight of the Century") of Millennium, playing the long-estranged father of Frank Black (Lance Henriksen). In 1986 he took a part in John Irvin's Raw Deal, alongside then rising star Arnold Schwarzenegger; McGavin plays a long time FBI officer who enlists a former colleague to help him unmask a mole within the Bureau working for a Chicago mob family. He won a CableACE Award (for the 1991 TV movie Clara) and received a 1990 Primetime Emmy Award nomination for Outstanding Guest Star in a Comedy Series on Murphy Brown, in which he played Murphy's father, Bill. From 1993 to 1994, he appeared in an Off-Broadway production of Greetings. Gavin co-starred with Adam Sandler in Billy Madison (1995), playing the titular character's hotel magnate father. In 1998, McGavin was asked to play the role of Arthur Dales in The X-Files, and appeared in two episodes between then and 1999. McGavin died on February 25, 2006, of cardiovascular disease in a Los Angeles hospital, aged 83. He is interred at the Hollywood Forever Cemetery. McGavin was married three times. He first married Anita Marie Williams in 1942. He later married Melanie York on March 20, 1944; their marriage ended in divorce in 1969, but produced four children: Bogart, York, Megan, and Bridget McGavin. The third was to Kathie Browne on December 31, 1969, ending with her death in 2003. McGavin was a staunch liberal and an active Democrat. ^ "Darren Mcgavin Biography (1922-)". FilmReference.com. ^ Herz 1975, pp. 18–19. ^ Herz 1975, p. 19. ^ Herz 1975, p. 20. ^ a b c Benjamin, Scott (February 26, 2006). "Actor 'Night Stalker' McGavin Dies". CBS News. Retrieved December 27, 2016. ^ a b Risling, Greg (February 26, 2006). "Actor Darren McGavin Dies at 83". The Washington Post. Associated Press. Retrieved December 28, 2016. ^ Herz 1975, pp. 20–21. ^ Herz 1975, p. 21. ^ a b Herz 1975, p. 22. ^ Murphy 1995, p. 70. ^ "Darren McGavin". Playbill. Archived from the original on December 9, 2018. ^ a b Herz 1975, p. 23. ^ a b "Darren McGavin Filmography". AFI Catalog of Feature Films. Los Angeles, California: American Film Institute. Archived from the original on December 9, 2018. ^ a b c d e "Darren McGavin Credits". TV Guide. NTVB Media. Archived from the original on December 10, 2018. ^ a b Inman, Dave (October 1, 2000). "Darren McGavin, Burt Reynolds starred in NBC's 'Riverboat'". Florida Today. Cocoa, Florida. p. 3 – via Newspapers.com. ^ a b King, Paul. "Darren McGavin Fine Actor Also Hard-Boiled Egghead". Vancouver Sun. Vancouver, British Columbia. p. 31 – via Newspapers.com. ^ Bancroft, Peggy (August 28, 1964). "Darren McGavin's York Unusual Kid On And Off Stage". Pocono Daily Record. Stroudsburg, Pennsylvania. p. 19 – via Newspapers.com. ^ a b c Biggers, Buck (January 3, 1975). "McGavin Has Much Talent But 'Carl Kolchak' May Die". Courier-Post. Camden, New Jersey. Gannett News Service. p. 25 – via Newspapers.com. ^ Geoghegan, David (July 16, 1978). "Darren McGavin And Wife Team Up On Film". Longview News Journal. Longview, Texas. p. 3-I – via Newspapers.com. ^ Dawidziak, Mark (November 29, 2013). "Remembering Darren McGavin, the Old Man in 'A Christmas Story'". Cleveland.com. Cleveland, Ohio: Advance Local Media LLC. Archived from the original on December 10, 2018. ^ Kashner, Sam (November 2016). "How A Christmas Story Went from Low-Budget Fluke to an American Tradition". Vanity Fair. Condé Nast. Archived from the original on December 25, 2017. ^ Siskel, Gene (June 6, 1986). "`RAW DEAL`: THE TITLE SAYS A LOT ABOUT CONFUSING PLOT". Chicago Tribune. Chicago, Illinois. Archived from the original on December 10, 2018. ^ "Darren McGavin". Emmys.org. Television Academy. Archived from the original on December 10, 2018. ^ Willis, John (1996). Theatre World 1993-1994. 50. New York: Applause Books. p. 70. ISBN 978-1-557-83235-1. ^ O'Bryan, Joey (February 17, 1995). "Billy Madison". Austin Chronicle. Austin, Texas. Archived from the original on December 10, 2018. ^ Mooney 2017, pp. 17–21. ^ Brozan, Nadine (February 27, 2006). "Darren McGavin, Versatile Veteran Actor, Dies at 83". The New York Times. Archived from the original on December 27, 2016. ^ Stephens & Stephens 2017, p. 77. ^ "California, County Marriages, 1850-1952," database with images, FamilySearch (https://familysearch.org/ark:/61903/1:1:K8VT-926 : 28 November 2014), William Lyle Richardson and Anita Marie Williams, 15 Aug 1942; citing Los Angeles, California, United States, county courthouses, California; FHL microfilm 2,114,960. ^ a b Gibron, Bill (February 28, 2006). "Soldiering on: Darren McGavin (1922-2006)". PopMatters. Archived from the original on December 10, 2018. ^ Kelley, Bill (March 20, 1988). "A Star, with or Without the Billing". Sun-Sentinel. Fort Lauderdale, Florida. Archived from the original on December 10, 2018. ^ "1968 Presidential Race - Democrats". The Pop History Dig. The Pop History Dig, LLC. Archived from the original on December 9, 2018. Herz, Peggy (1975). TV Close-ups. New York: Scholastic. OCLC 2360608. Mooney, Darren (2017). Opening The X-Files: A Critical History of the Original Series. Jefferson, North Carolina: McFarland. ISBN 978-1-476-62880-6. Murphy, Brenda (1995). Miller: Death of a Salesman. Cambridge: Cambridge University Press. ISBN 978-0-521-47865-6. Stephens, E. J.; Stephens, Kim (2017). Legends of Hollywood Forever Cemetery. Charleston, South Carolina: Arcadia Publishing. ISBN 978-1-439-66142-0. Riverboat: The Evolution of a Television Series, by S. L. Kotar and J. E. Gessler. Albany, BearManor Media, 2010. ISBN 978-1-59393-505-4. Wikimedia Commons has media related to Darren McGavin. This page was last edited on 24 March 2019, at 05:16 (UTC).